Can enamines be formed from α,β-unsaturated ketones? Can enamines actually be formed from α,β-unsaturated ketones? If not, what prevents it from being possible? Stork and Birnbaum have reported (Tetrahedron Lett. 1961, 10, 313) the formation of dienamine 2 from octalone 1. 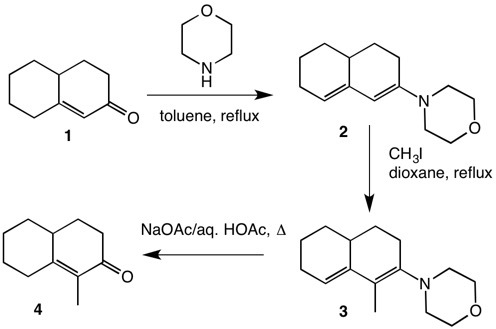 Alkylation with methyl iodide leads to α-alkylation of the dienamine. Buffer conditions are required for hydrolysis of the dienamine to octalone 4. Not the answer you're looking for? Browse other questions tagged organic-chemistry carbonyl-compounds amines c-x-addition or ask your own question. Why can't Pd/C and H2 reduce both the alkene and carbonyl portions of α,β-unsaturated carbonyls? Does rearrangement occur in Friedel Crafts alkylation or not?